So allegedly construction workers are now being bid out of Poland back into Ireland, the cranes are rising everywhere. Indices of construction activity are up in value, officially, q/q and y/y, while volume of activity is up y/y. 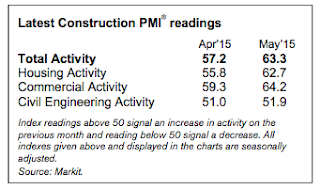 PMIs are signalling massive increases in building. But the latest Building Information Index shows that the value of construction projects launched in 1Q 2015 was down EUR333 million or -20% on 1Q 2014, declining to EUR1.359 billion. In five out of seven escorts covered by the report there have been declines in activity, led by residential building sector that posted a decline of EUR174 million to EUR600 million in 1Q 2015. Good news, applications for new build are up 42% y/y in terms of value (including price and cost effects). Not surprisingly (down to price and development costs inflation), residential sector value of new applications is up 91%, while commercial is up 59%.